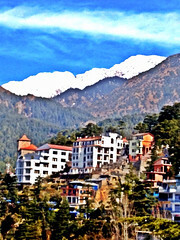 It is a bright sunny day in McLeod Ganj. 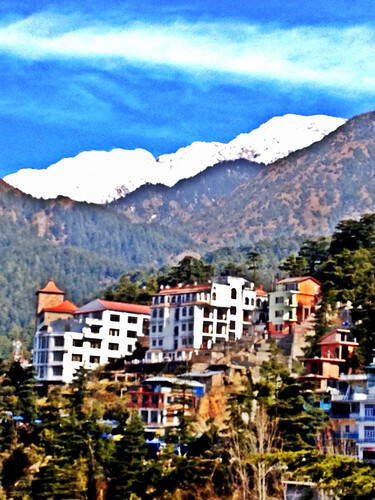 This is the Himalayan mountain village in Dharamsala that is home to the Dalai Lama residence and temple, and the Tibetan History Museum. 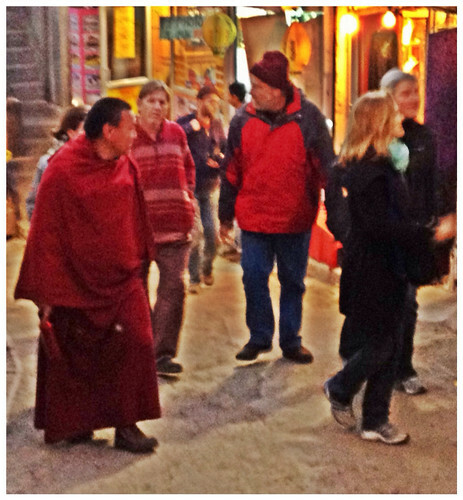 Since I visited here last year, I made friends with a guy at at a pashmina shop (a whole other story) as well as a monk, both of whom I have been able to reconnect. It feels like a small world to have friends to revisit in faraway places. One of those friends, Tibetan Buddhist Monk, Lama Bagdro, author of A Hell on Earth, visited us and shared his incredible story of working for freedom within Tibet and then his escape from his homeland to India in the late 80’s. He also performed Buddhist chanting for us. It is a rare talent for a man so young. Taking vows as a monk means dedicating your life to prayer and study. Because of his experiences and his apparent dharma working for the liberation of Tibet from Chinese rule and constantly touring to educate the world about the situation in Tibet, Bagdro does not have as much time as he would like to study. There is a part of him that would like for his life to be that easy, but he knows in his heart as well as from the encouragement of the Dalai Lama, that he must continue to do his work. His is a very hard road and he has survived so much unfathomable suffering. He works tirelessly and selflessly, he laughs as heartily and he has a most generous smile. Bagdro is a true luminary. Yesterday was Tibetan New Year, which he was not celebrating due to the recent deaths and escalating awful state of the human rights situation in Tibet. Instead, he joined us for dinner, and because we are such a small group this year, it was an intimate experience with him. Bagdro is three years older than I am. He is bright, funny, charming, and cool. I asked him if knows of the Beastie Boys, and MCA, and their career-long support of Tibet. Bagdro was kind, and sort of like …”well yes I know them. 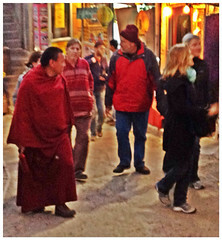 Adam Youch is his true name and he is married to a Tibetan woman.The Free Tibet concert in ’97 was a huge deal”. Among other national and international speaking engagements and constant political meetings, Bagdro is currently collaborating with a German hip-hop group who are using samples of his chanting on a cd, and in turn he is making more contacts for speaking engagements throughout Europe to raise awareness to save his home country. If Bagdro weren’t a sweet sweet holy man and fearless human rights activist, he might be hipster before hipster was hip. This morning I taught yoga in the sitting room where he chanted for us last night. We dedicated our practice to Lama Bagdro. The theme of the asana sequence was to model Bagdro’s kindness and courage in our hearts and balance it with his mountain-like fortitude in our bodies. 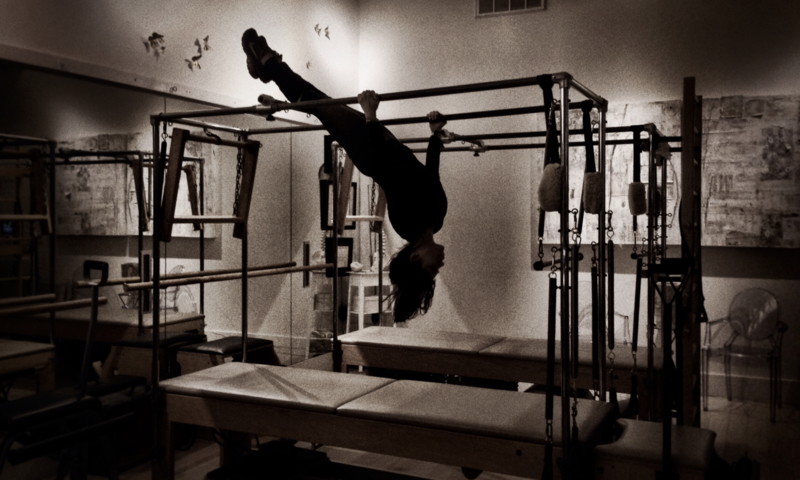 This equipoise of energies is Yoga. Beautiful Lama Bagdro teaches us well. No Internet connection has been available for the last two days. So, the blog posts are maybe a day behind. Oh well. C’est la vie. No really..It is good to be completely unplugged for a bit. The computer compulsion is completely exposed. Oy vey! In the morning, I skip the group activity to the Golden Temple (I went there last year) to have sunrise meditation on the roof of the palace and some quiet time at the hotel. There is a full fledged monkey invasion on the terrace outside my room. I watch in awe as they almost wreak total havoc on furniture, light fixtures, and plants. While on the phone alerting the front desk, one smart monkey checks every door knob to the rooms on the terrace to try and enter. Total mayhem! Monkey business here is serious. After reconnecting with the group, we visit Sarnath which is a 5km field trip out of town which takes about an hour travel time. Sarnath is the ‘birthplace of Buddhism’, called such because it is where the Buddha gave his first sermon. Deep huge historical significance here. Today I learn that Hindus worship the Buddha, along with all of the other deities. Buddhists follow Buddha only. That is massively oversimplifying. But the most important lesson for me once again is that It’s ALL connected and we are all ONE. Finally, the end of the day takes us to the house of a highly revered Sanskrit grammarian, teacher, writer, artist, and musician named Vagish Sastri. The audience with him has opened up new worlds for me in thought, feeling, and awareness. It’s a whole post’s worth of reflection. More on that later. Peace and love and music from the Motherland. 4am rise and shine. My inner clock is sill figuring out India time. Easy trip to Delhi airport and a ride on SpiceJet to Varanasi. Today is Maha Shivaratri, a Hindu festival and national holiday that celebrates the anniversary of the marriage of Shiva which is symbolic of the union of the Spirit and Relative worlds. This is YOGA!! Varanasi is the holiest of all Hindu cities. On any ‘normal’ day, the energy here is electric. There are Indian pilgrims bathing in the river. The labyrinth of ancient alleyways are teeming with the hustle and bustle, twists and turns of the living. 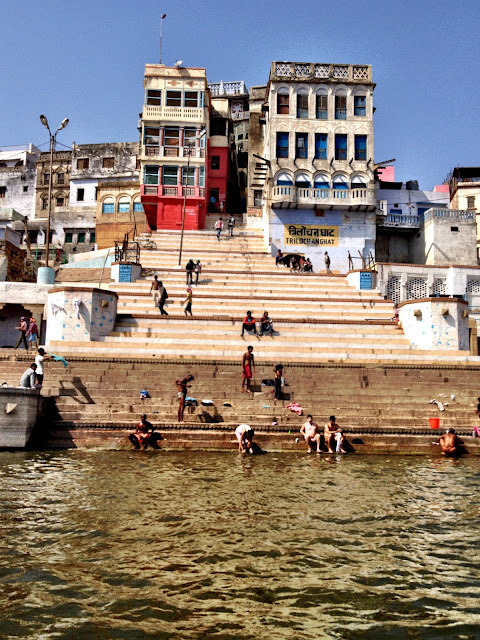 The Ghats – stepped terraces that line the banks of the river – are both seats of ancient ritual honoring the earth elements and cremation grounds to begin the transition to Spirit world. Mystics and religious call Varanasi a tirtha, or crossroads, where man has a portal into the realm of the gods, and where the gods descend to be among man. Here, the ‘veil of time’ is thin all the time! It is as if the Ghats are a seam between the chaotic maze of material living in the streets and the natural ease of letting the river take it to the next realm. In Varanasi, humans literally walk that line between life and death. Not in daredevil or sad ways, but as witnesses, even spectators to the ultimate reality. Some of the images are very intense and disturbing to Western Brain. But here in Varanasi the sick, dying, and dead are as much a part of the scene as the living. It’s a stark reminder that we really are all in this thing together. Varanasi is INTENSELY WONDERFUL. Not for everybody. But, as it is my second visit here, I know in my blood it is not the last. That today is a celebration of Shiva, it is extra wild here. This is Shiva’s city! It is Mardi Gras at home. That we are all on the cusp of celebrating Spirit manifest in Culture… There are no coincidences only auspicious unions! So many crazy incredible unplanned events happened today. A boat ride on the river bc ‘it’s the only way to get there’….a newly renovated boutique hotel in an ancient palace with th most breathtaking yoga room overlooking the river…a sweet sweet small group of fast friends. And the tangible buzz of ‘the shakti of the Universe’ which my friend Michele Baker calls the Ganges. This has been a long beautiful day and now it must end. MAHA SHIVARATRI! HAPPY MARDI GRAS!! Today is an un-structured, no-plans day. Perfect for Sunday. Still a bit jet laggy but actually it is only affecting bed and wake up times. I feel like a band dude… Up til 3, sleep til almost noon. Kind of fun! Around noon the ‘Nirvana Wellness Spa’ catches my attention. Still kind of in a dreamy state, I stumble into an hour-long Thai foot massage. Which was awesome on about a million levels and made me super hungry. My room mates and I walk about a mile down a very dusty and dingy road (which is more like a highway) to a swanky hotel where we have read has a great restaurant. I am not usually one for a buffet (that it is the most common mis-spelling of my last name is very annoying, and also it’s usually just too much) but this is a most exotic and vast spread of South Indian, Continental Indian, and Chinese food (Indians love Chinese food like we love Mexican food). Plus soups, breads, nan, and so many tiny desserts. This has been a super Olympics for my taste buds and takes ‘Indian Buffet’ to a whole new stratosphere. Our further adventure outside led to the massive (like 5 stories tall) Shiva Murti. A murti is a sacred symbolic statue, usually for an altar. Apparently the Indira Ghandi airport had to reroute flying patterns to accommodate for this Shiva Murti. It is massive, and a great reminder of how the Spirit world is woven into the fabric of the culture and manifests as larger than life temples on street corners and roadsides everywhere here. This particular expression if Shiva is said to have a blue neck because he swallowed the poisons of the oceans on behalf of the gods. He holds a trident and his favorite city is Kashi, also known as Varanasi. Which is where we travel tomorrow. Om Namaha Shivaya! Entry into Delhi and reaching the hotel has been way less complicated than last year’s Mumbai odyssey. Immediately as I de-plane, I become aware of the faint hint of incense that seems to permeate the atmosphere and it hits me that I am here. Incredible India. The Mother Country. The hotel Dee Marks is near the airport, not in the heart of the hectic huge filthy city, but convenient for the trickling in of adventurers arriving for the first leg of the trip. Dee Marks is a huge wedding resort. From afar it looks like Las Vegas with zillions of lights strung up everywhere. Traditionally a Vedic astrologer is consulted on all phases of marriage from assisting the arrangement of partners to reading birth charts to determine the exact day and time the sacred ceremony should take place. This possibly explains why there was a wedding happening on the terrace at 2am, the first of three ceremonies I’ve seen in less than 24 hours. It totally feels like Mardi Gras around here! Once the sacred fire and chanting ritual is complete, something in the way of a second-line happens. Women decked out in jaw-droppingly ornate saris and suit clad men make their way in procession with ecstatic drums and music to a resplendent Indian buffet steaming hot waiting in the wings. This is a major party! All that’s missing are the white hankies! Apparently if a foreigner ‘crashes’ a wedding it is looked upon as auspicious and very good luck for the couple. I am so tempted. I am happy to report that I am in possession of Yoga Birds’ harmonium! 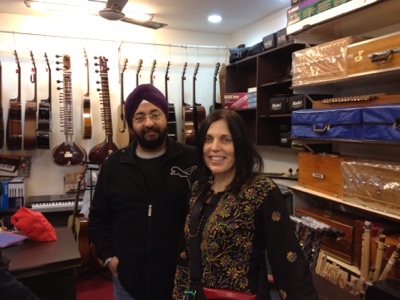 After months of research I found DMS a music store in Delhi that makes and sells Indian instruments as well as guitars. Burke, whose fave store is naturally Guitar Center asked me recently if DMS is like the ‘Sitar Center’ of India. Hilarious, right? Anyway I met the owner of the shop, Inni Singh, whom I am friends with on Facebook and also to whom I emailed a few weeks back telling him of my forthcoming visit. He has made custom instruments for Krishna Das and other notable musicians. He is the 2nd generation owner of DMS. His mother who opened the shop in 1970 was there and made steaming chai tea for us to enjoy which made the whole experience superexcellent. 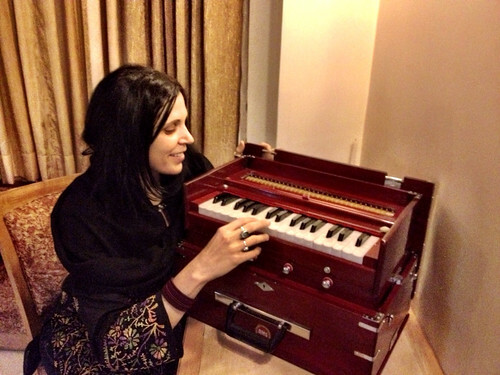 Inni hooked me up with a small sized portable harmonium handmade by craftsmen in his workshop right here in Delhi. The sound is rich and full and heavenly. I have absolutely NO IDEA how to play it. In fact I can barely open and close the thing! I am just staring at it thinking a lifetime of potential beauty sits in that box. My heart’s intention of learning how to unleash it, channel it, and harmonize with that SHRI is what this trip is all about. Mother India will let it unfold in her mysterious ways. Today Holbrook our Redback Travels guide arrived. We have the detailed trip itinerary that tells me when and where I will be teaching yoga for the next two weeks as well as the schedule of harmonium lessons Redback has arranged per my special request. I smile inside and out with great gratitude for my life. Really, I am pinching myself constantly. 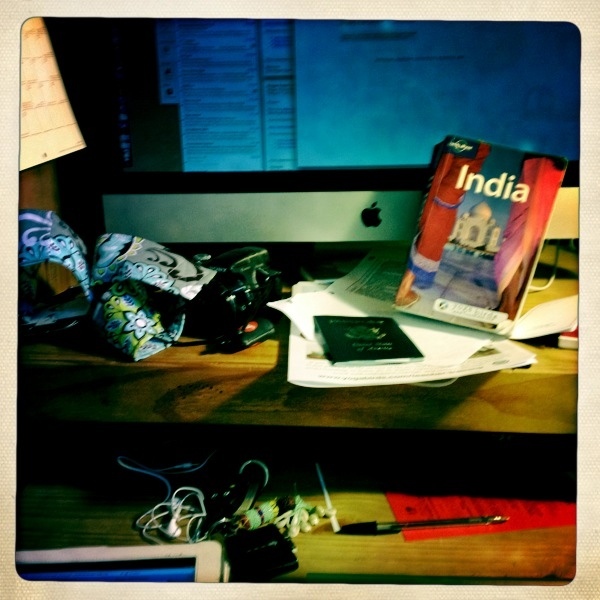 T minus 3 days until my departure for a second adventure to India. My tasks and to do lists are almost ridiculous in their reality of ‘getting done’. I have vowed to enjoy every minute of this week. Jai India!